Revised reports are posted below for 2Q 2017, based upon a discrepancy in the current and historical inventory statistics. Upon review, a MLS data update in early June resulted in the inaccurate counts. While the current Greater Charlottesville statistic for “inventory of homes for sale” was previously stated as 1,651 (-29.7%), it is in fact 1,438 (-12.1%). It was also brought to our attention that “proposed” properties were included in current and historical counts; these have since been removed. 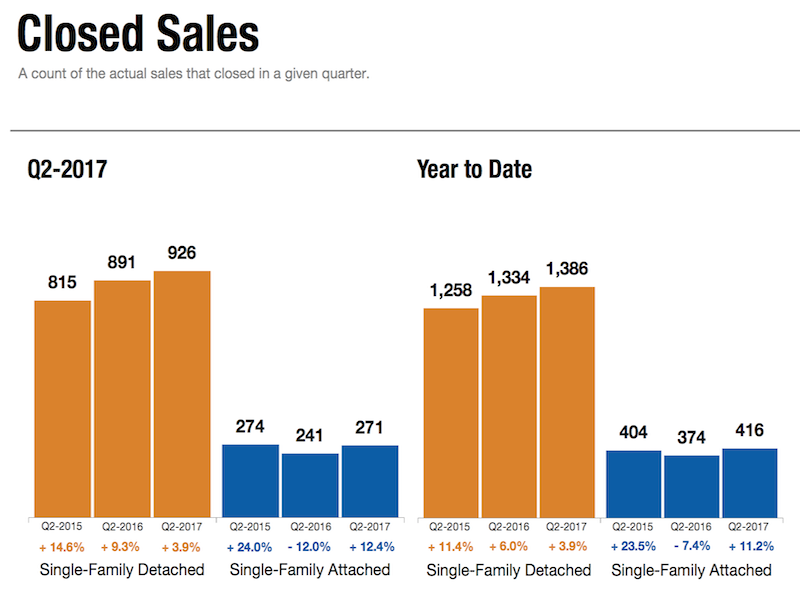 Our Charlottesville Area Association of Realtors has just released the latest real estate market report showing stats for sales in our area, 2017 2nd Quarter. This report comes out Quarterly and gives us a good idea of the current Real Estate Market in the greater Charlottesville Area. The specifics are pulled from our local MLS and you have likely been advised by your agent of specific trends in your area. Remember to discuss specific market conditions with your Charlottesville Realtor. Closed Sales increased 3.9 percent for Single-Family Detached homes and 12.4 percent for Single-Family Attached homes. Pending Sales decreased 0.9 percent for Single-Family Detached homes and 6.9 percent for Single-Family Attached homes. Inventory decreased 11.9 percent for Single-Family Detached homes and 13.0 percent for Single-Family Attached homes. The Median Sales Price increased 5.3 percent to $340,000 for Single-Family Detached homes and 5.2 percent to $241,000 for Single-Family Attached homes. Days on Market decreased 38.1 percent for Single-Family Detached homes and 31.3 percent for Single-Family Attached homes. Homeownership was less affordable, as the Housing Affordability Index was down 6.7 percent over last year, at 112.